Marie A. Chisholm-Burns, PharmD, MPH, FCCP, FASHP is Professor and Head, Department of Pharmacy Practice and Science, The University of Arizona College of Pharmacy, Tucson, Arizona. 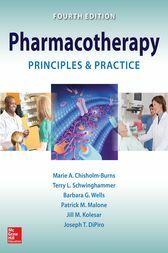 Terry L. Schwinghammer, PharmD, FCCP, FASHP, BCPS is Professor and Chair, Department of Clinical Pharmacy, West Virginia University, School of Pharmacy, Morgantown, West Virginia. Barbara G. Wells, PharmD, FASHP, FCCP, BCPP is Professor and Dean, Executive Director, Research Institute of Pharmaceutical Sciences, School of Pharmacy, The University of Mississippi, Oxford, Mississippi. Patrick M. Malone, PharmD, FASHP is Professor and Associate Dean, Internal Affairs, College of Pharmacy, The University of Findlay, Findlay, Ohio. Jill M. Kolesar, PharmD, BCPS, FCCP is Professor, University of Wisconsin School of Pharmacy, and Director, 3P Analytical Instrumentation Laboratory, University of Wisconsin Paul P. Carbone Comprehensive Cancer Center, Madison, Wisconsin. Joseph T. DiPiro, PharmD, FCCP is Professor and Executive Dean, South Carolina College of Pharmacy, University of South Carolina, Columbia, South Carolina, and Medical University of South Carolina, Charleston, South Carolina.